A need this one for my records since my children sometimes want to cook this on their own. It's almost the same as my Salmon Head Sinigang though here the fish is substituted with pork. 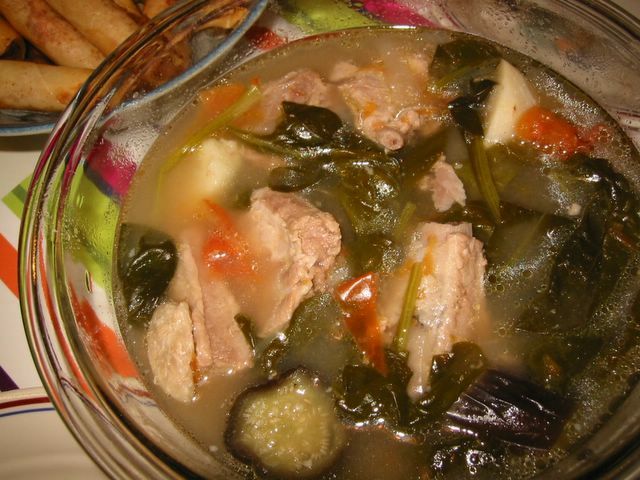 You can also read in that post the different nuances of cooking sinigang and the different souring agents used. The chilis used here are the long thing variety, they're about 3 - 4 inches long. Sinigang is a regular in our dining table because it never fails to satisfy our craving for something soupy hot especially on a chilly day. Combine tomatoes, onion, and sea salt in a big pot. Add chillis (optional) and pork. Add water and bring to boil. Lower heat and cook for about 5 minutes. Mash the tomatoes with a sandok (cooking spoon). Simmer until pork is tender (about 1 hour 15 minutes). Add taro, aubergine and sitaw. Bring to boil and simmer until taro is almost cooked (about 5 minutes). Add the souring agent and spinach (for tamarind puree I use about 1/2 cup of it plus a squeeze of lemon/lime). Cook for 1-2 minutes. Taste soup and adjust seasonings accordingly. Serve hot.